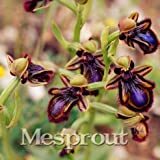 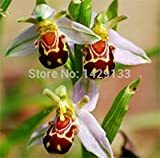 Ophrys tenthredinifera growing herbaceous rhizome of the genus Ophrys also known as Sawfly orchid, Ophrys tenthredinifera perennial deciduous plant used as ornamental cut flower plant, can grow in mediterranean, subtropical or temperate climate and growing in hardiness zone 6-10. 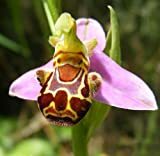 Flower shape looks like female bees and attract male bees, flowers grow on stem in inflorescence, some of the orchid pollinate in self-pollination, the flowers are small 0.5-4 cm, and flower color can be: the 3 petal can be: white, purple or something in the middle, “hand and legs” green to yellow, the “body” black, white, purple and brown, flowers have hairs. 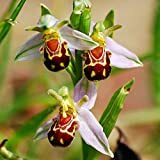 Color of 3 petal can be: white, purple or something in the middle, “hand and legs” green to yellow, the “body” black, white, purple and brown, flowers have hairs, flowers grow on stem in inflorescence, some of the orchid pollinate in self-pollination, the flowers are small 0.5-4 cm.